The Great Wave off Kanagawa (神奈川沖浪裏 Kanagawa-oki nami ura, “Under a wave off Kanagawa”). Print at the Metropolitan Museum of Art. Artist: Katsushika Hokusai. On New Year’s Day, 1995, sailors aboard the Draupner oil rig off the coast of Norway were in for quite the surprise. Instead of fireworks, however, the crew was shaken by an ungodly wave measuring 25 meters (80 feet) in height, seemingly coming out of nowhere. This phenomenon, known as a rogue or freak wave, had been previously predicted theoretically but the Draupner incident — perhaps a one in a century event — was the first evidence to support their existence. Evidence of other such waves soon followed. 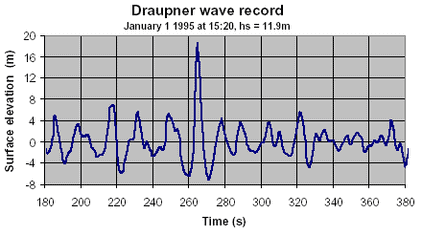 The Draupner wave or New Year’s wave was the first rogue wave to be detected by a measuring instrument, occurring at the Draupner platform in the North Sea off the coast of Norway on 1 January 1995. Credit: Wikimedia Commons. Now, after almost 25 years of investigations, scientists at Oxford and the University of Edinburgh have finally uncovered the formation dynamics of such monstrous waves. Inside a test tank at the FloWave Ocean Energy Research Facility in the UK, the researchers generated waves of various amplitudes and frequency, tweaking parameters until they found that a giant wave formed when two waves intersect at exactly 120 degrees. The findings appeared in the Journal of Fluid Mechanics. The lab-made Freak Wave was much smaller than the Draupner wave, measuring less than two meters in height. However, seeing how its relative height was double that of the waves that produced it, researchers are confident that the same dynamics are at play in the open sea. 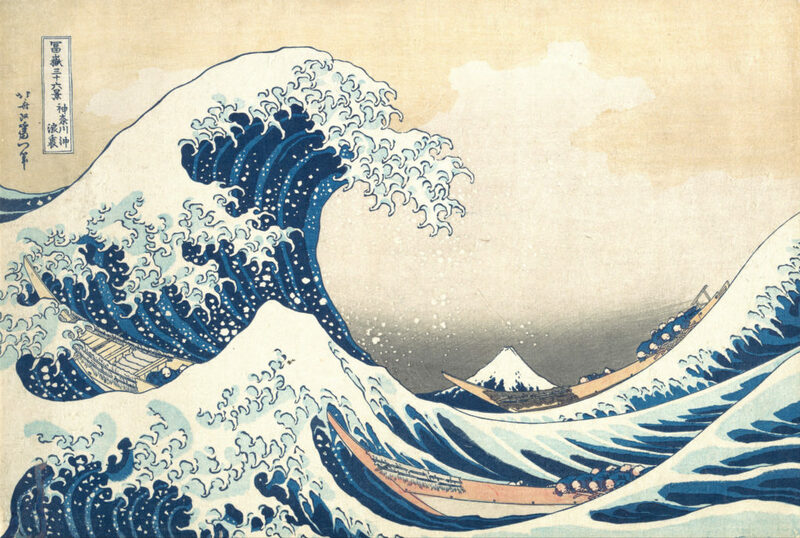 The freak wave generated by the British researchers not only bears a strong resemblance with photos of real freak waves in the ocean but also to “The Great Wave off Kanagawa’ – also known as “The Great Wave’ – a famous woodblock print published in the early 1800s by the Japanese artist Katsushika Hokusai. The artist may have witnessed a freak wave, serving as inspiration for his masterpiece, although there is no evidence to back up such a claim. The video below shows the freak wave formation process from start to finish. The 1995 freak wave that hit the Draupner oil rig resulted in minimal damage, but others haven’t been that lucky. Freak waves have caused considerable damage to ships in the past and even fatalities. This is why the researchers hope that their research will lay the groundwork for being able to predict potentially catastrophic waves and issue timely warnings accordingly.